Hindu calendar April 2011 or free Hindu desktop calendar wallpaper for April 2011 is here to download. 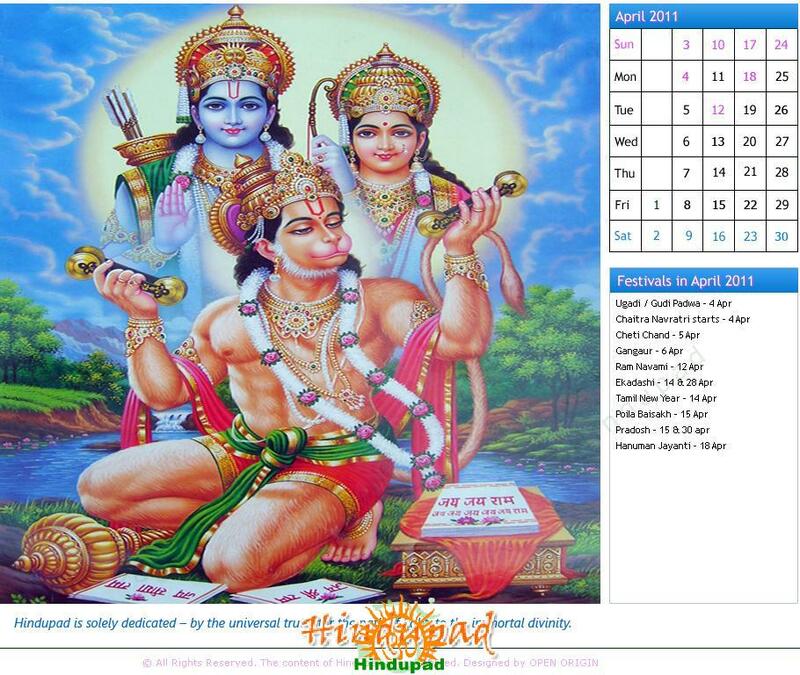 As Sri Rama Navami and Hanuman Jayanti are the important festivals in April 2011, the wallpaper calendar is designed with the image of the divine couple Sri Sita Ramachandra swamy and Lord Hanuman. Dates of the important festivals in April 2011 are also included in the desktop calendar. Some of the other big festivals in April 2011 are – Chaitra Navratri, Ugadi (Kannada and Telugu New Year), Gudi Padwa (Marathi New Year), Sansar Padvo (Konkan New Year), Nav Varsh, Navreh (Kashmiri New Year), Sri Ram Navami, Pohela Boishakh (Bengali New Year), Mahavishuva Sankranti or Pana Sankranti (Orissa New Year), Chithirai Vishu (Tamil New Year), and Hanuman Jayanti. April 2011 coincide with Chaitra Month in Marathi, Gujarati, Kannada, and Telugu calendar and it is Chaitra and Vaishakh month in North Indian Hindi calendar. It marks Panguni – Chithirai masam in Tamil calendar; Meenam – Medam month in Malayalam calendar. Here you can read the festivals and auspicious days calendar of April 2011. Read Daily Panchangam – daily Nakshatra, tithi, vrat, and auspicious muhurat in April 2011.